Have you ever wondered why certain parts of a website catch your eye and you ignore or completely miss others? Whether you are designing a corporate website, simply working with a private site, or setting up a blog for the first time, this book will take you into the world of design and what works. Authors: Neilson and Pernice take us on a detailed journey demonstrating what works and grabs your attention longer than a split second. Eyetracking technology allows you to see what people see on mainstream websites. This book’s main focus is “to study look patterns and how they relate to Web usage”. It is “not a general book about Web usability”, although it gives an excellent insight into why people go to certain areas on a page. Throughout the eight chapters, we learn how “Eyetracking” technology works. Also, you will find a summary covering human behavioral patterns, resulting from these extensive studies. The second chapter is a little dry as it explains how this technology works, data collected, fake tests, study participants and cost evaluations. Other chapters get into the heart of page layout, navigation design elements and images. Chapter seven covers advertisements which is a major aspect of the Internet. Everything, from when people look at ads to the impact of ad placement, is detailed in a quite interesting fashion. Here is where you find out what works and what fails. The authors point out the need for corporate executives to stand aside and let the professional graphic designers do their job. They show how upper-level management employees who know nothing about design and graphics can destroy the design due to ignorance of “web usability” and drive customers away. If you are, in any way, part of a team that works on websites, or if you have your own personal blog and want your sites to work, this book is something that you will keep going back to as a reference guide. There is an excellent Table of Contents in the front and a well laid out Glossary in the back to make sure you find exactly the topic to research and learn. Please Note: This article is published in First Monday magazine April 2010. If you are bent on getting an iPad don’t ready any further. However, if you are trying to decide between buying a laptop and an iPad this article is for you. I like my laptop because I can load any software, connect any device such as a digital camera, memory stick, backup drives, by USB connections. I like the idea of being able to load free software from any company or source and not be restricted to one company such as Apple. For me, choosing a laptop is simple: Macbook. I run Windows XP and Windows 7 on my Mac laptop without a glitch. Of course there are many other laptops, notebooks and net books that work great too and all of them avail you the opportunity to install third party applications, many at no cost. The iPad has landed in North America and is creating huge hype. Rightfully so! It is a wonderful device allowing for various functions. According to Wikipedia the iPad “is part of a device category between a smartphone and a laptop computer.” This may be true but it is not close to my Macbook laptop, not by a long shot. For starters the hard drive is only 16 to 64 gigabytes (GB) of flash memory (a technology that is primarily used in camera memory cards). My laptop is 250 GBs and with a terabyte hard drive connected by USB, I now have a grand total of 1274 GBs of hard drive space. Very different from 16 to 64 GBs of the iPad. The iPad’s 9.7-inch (25 cm) screen has a low end resolution of 1024 X 768. What this tech talk means is that the iPad will not support HDMI video which many have come to love. With high definition the rave…Why go back to a lessor screen resolution. This does not make sense. Other features lacking in the iPad are: no camera, no webcam, no multitasking, no drag and drop file management, no USB port, no SD slot, no Flash, no HDMI out, no 1080p playback, and no native widescreen. Are we going backwards here? In 2005 it was “the Year of High Definition Video,” according to cnet.com. How come the iPad lacks these features? 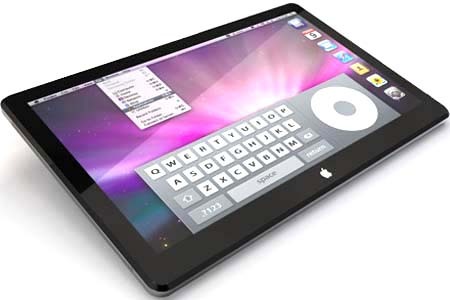 Many are saying the iPad has its neat functions and is esthetically appealing. Just make sure you are getting the exact features you require in any tech device. Do your homework on this one. Probably by now most people have used or heard of the free directory assistance that is available on the Internet: canada411.ca. That service works for both individual and business phone numbers and addresses. Google has taken this technology much, much further. Enter: Google411. Google offers a free phone directory and calling service that finds businesses and their phone numbers. Google will also connect you to the business immediately, or you can simply listen to the list of businesses and then make your choice. The service is quite easy to use. You simply dial up 1-800-GOOG-411 (I have GOOG411 on my cell phone’s speed dial) and state your city and province. Then you say what it is you are looking for. I tested it out by saying: “pizza”. A google voice began voicing the area pizza restaurants. If I had been hungry I could have easily been connected to the pizza business of my choice. This proves to be an excellent travel tool as you may want to book ahead a hotel room, reserve a seat in a restaurant and maybe check if a certain store is still open. At the present time Google only offers this service for business and non-profit listings, but not for residential information. I love canada411.ca on my laptop for looking up names, addresses, and phone numbers, but when I nowhere near a WiFi hotspot, my cell phone gets me the information, connection and listings fast and extremely efficient. For more information, head on over to this website: www.google.ca/goog411 and watch a Google voice engineer demonstrate this highly excellent and free service. Note: “ Google doesn’t charge you to access Google products from a mobile phone…Check with your provider for more information about fees associated with accessing the Internet from your mobile phone” (google.ca). Published by O’Reilly Media Inc. If you love your Mac, you will love this book. This book details every aspect of the Leopard operating system, from simple to advanced. Looking up how to do something is fast and easy, although this book is a real treat for simply browsing topics to learn some tricks and tips that you won’t find in most other Help sections. For instance, only about 4% of us back up our computers and now there is no excuse. Leopard comes equipped with its own backup system, Time Machine, and with this book you can easily follow the simple step-by-step process to ensure you never lose anything again. When working through these types of sections you can easily set up the process, read the technical stuff, or try out some of the exciting tips that are all highlighted: basic, moderate, and advanced data. But the bottom line is all these sections are designed to get you going, give you the “under-the-hood” scoops, and show you some magic tricks to boot that helps make this book a good read. Apple created 300 new features inside Leopard, however they failed to let you in on many of the tricks and tips that “demystifies” this amazing new operating system. In this book David Pogue also shows “refugees”, who escaped Windows and moved to a Mac. 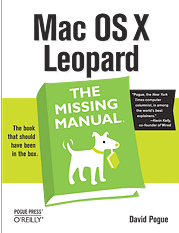 Windows users need no other books, as Pogue shows where they went in Mac OS X 10.5. This book is spread out in six parts: The Mac OS X Desktop, Programs in Mac OS X, The Components of Mac OS X, The Technologies of Mac OS X, Mac OS Online, Appendices. In the first part you discover folders and windows and how to organize your data. Pogue takes you through the various items such as: Spotlight searching, using the Dock, Desktop and Toolbars and gives you an expert feel as you see how simple Leopard is to use. Without a doubt, this book is a great refresher; it is one that you will refer to when you you’re stuck. The thing I really like about this book is that you can pick it up and open it anywhere and begin reading. I highly recommend this book for all level of users, both as a learning tool, and as a quick reference guide. Before you call a technician for a problem, treat yourself to this “must have” book first. Here is a website that shows you HOW TO in many areas. I find this site http://www.ehow.com/guide_5-computers.html very useful in the latest computer tips in PLAIN ENGLISH. http://www.ehow.com/videos.html – scroll down where it says: More Featured Videos and use the slide bar on the right to see tons of topics. let me know how you find this site?? ?